Join CRC’s 22nd Annual Source to Sea Cleanup on September 28 & 29, 2018. Use the online registration form to register both new & returning cleanup groups. Or, if you don’t want to organize your own cleanup event, visit the Join a Group page to find a list of groups near you. As always, we are here to help. If you have any questions, need assistance with your planning or have limited computer access, please contact Stacey Lennard, Cleanup Coordinator at cleanup@ctriver.org or 413-772-2020 x211. Thank you for helping clean up our rivers! Register your cleanup group. Register by September 4 to allow time for supplies to be shipped to you. Supplies and tee shirts are distributed on a first-come, first-serve basis so register early. Find a Cleanup Site – Good cleanup sites can be on islands, near rivers, behind schools, along trails or roadways. They are accessible, safe and are places where volunteers can make a difference. If you need help finding a site, check out the map of sites in need of adoption or get in touch with us. Recruit Help – Inform cleanup volunteers how to contact you, where & when to meet, what to bring and what to do in case of bad weather. Pick Up Trash – Arrange for trash & recyclables pick up. Your town’s Department of Public Works (DPW), Parks and Recreation Dept. or local trash/recycling company may be helpful in donating these services to you. Contact them early so they can plan for the event. Apply for the Bridgestone Tire 4ward free tire recycling program if your site has many tires. Trash Tally – Group leaders are responsible for submitting one Trash Tally form for all the trash their group picks up. Tracking trash is one of the most important parts of the cleanup. It works very well to have one volunteer or team sort trash and recyclables and another volunteer record the information on the Trash Tally form. Please submit Trash Tally forms (paper form or online) within a week after your cleanup. Safety & Waivers – It is the group leader’s responsibility to collect a signed waiver from EACH participant, adult or child. Also, the group leader is expected to have backup plans in case of an emergency or poor/unsafe weather. *The Waivers & Trash Tally are required for every Cleanup group. The other documents are optional and can help advertise your cleanup in your region. * Waiver Forms – All volunteers must sign in and complete waiver forms. For your protection and ours, ensure that all your volunteers turn in their waiver forms prior to beginning the cleanup. * Trash Tally – Tracking trash is one of the most important parts of the cleanup. It works very well to have one volunteer or team sort trash and recyclables by type and another volunteer record the information on the paper form. Please submit Trash Tally forms (paper form or online) within a week of your cleanup. * Tire Dating Instructions & Form — NEW for 2018! We have created a method to date tires so that we can report to manufacturers and legislators that illegal dumping is still a problem. Please use these instructions in the field. You can report your findings on page 3 of the paper form or with your online Trash Tally (above). Sample press release – Adapt this document to reflect your local group’s information. Share this with local newspapers & radio stations to advertise your cleanup event and attract local volunteers. Event flyer – Adapt this document to reflect your local group’s information to advertise your cleanup and attract local volunteers. Hazardous Materials Report form – Tell all volunteers to report anything that may be a hazardous material. Please do not handle any item that you believe may be a hazardous substance! This includes any substance labeled: CAUSTIC, TOXIC, CORROSIVE, POISON, FLAMMABLE, WARNING, DANGER, or CAUTION. This form includes a list of materials that are considered hazardous. Report A Trash Site – If you know of sites in need of cleanup, other than the site your group plans to clean, let us know. We can connect groups in need of a cleanup site with sites your group may not be able to clean up. Business Support – Ask local businesses to support your cleanup with donations of food & beverages, first aid kits, heavy duty trash bags, or extra gloves. CRC provides basic supplies to all groups and a free Source to Sea Cleanup tee-shirt for group leaders and participants while supplies last. Group sizes range from 1 to 300 and everything in-between. There is just as much range in how groups organize their cleanup event. Beyond the responsibilities of choosing a site, arranging for trash/recycle pickup and tracking trash, there is no right or wrong way of doing things. Here are things that many groups find helpful to know. Please click the “+” signs to read through this list even if you have run a cleanup before. Share the load – If working with others, consider dividing up responsibilities, such as one person arranging for pickup, while another scouts sites, while another advertises the cleanup or handles thank yous and post-event publicity. Consider having a group meeting or phone call early in the planning season to discuss goals, available resources, and outstanding needs. Check out which other groups are nearby and ask them if they’d like to share resources, ideas, or press. Plan goals – Some groups discuss and decide on goals for their cleanups, such as attracting new participants, tackling some large trash, recycling as much as they can, highlighting the importance of a local stream or increasing their group’s visibility. Gather forms – Print out or request all the CRC forms you need or will help you in planning. Seek donations – Some groups request donations of food, additional supplies or gift cards from local businesses, including first aid kits, heavy duty trash bags, extra gloves, or donated gas cards for those providing car, boat or pickup services. When you call or approach a business in person, explain that you are helping to clean up the Connecticut River (or tributary) and you are wondering if they would be willing to make a donation (cash, services or supplies) for this worthy cause. The key is to ask at least one month in advance of the Cleanup so they will have time to do all the necessary paperwork and you’ll have time to publicize their generosity in the media. Some businesses may ask for a written request. Ask for more than what you need. Supplies will not go to waste! You can always pass extras on or save them for next year. Please remember to thank them very much for their generous contribution! A role for everyone – It’s not always possible to know who will join your cleanup ahead of time, but have a list of various jobs that groups or individuals can do while cleaning. This might mean that someone will record trash, while someone else sorts out recyclables, while someone else photographs and others clean. Consider the ages and abilities of your probable participants and try to ensure that each person feels his or her contribution is worthwhile. Welcoming new faces – If you know that someone in your group works with fostering abilities beyond disabilities or speaks another language, consider asking her or him to do a bit of outreach and bring someone from that community along. Music – Consider asking a local band to play at your Cleanup. Music can make the cleanup more joyful and the band will appreciate the airtime. Check out the river – Good sites can be visually identified by a walk or paddle along the river. Get a tip from the town – The Town Manager in your community may be able to suggest a good cleanup site. Your cleanup is helpful to your city, so they should welcome your call. Safety first – Sites need to be safe and accessible for the ages and abilities of all participants. If you are managing a large group of children (school group, youth group, etc.) please review our Child Safety Guidelines. Check on site conditions – It is important for group leaders to visit sites before the cleanup, identify potential hazards and check the weather forecast to ensure the safety of all participants. Can’t find a site? – If your group has tried but is having trouble identifying a good site, we may be able to help. First, check out this map of sites in need of adoption to find one near you. Still can’t find a site? Get in touch with us. If you have questions, please contact us at cleanup@ctriver.org or 413-772-2020 x211. Town assistance – Many municipalities (either the Dept of Public Works or Parks & Rec) will generously donate a dumpster or pickup services. How to request services – Plan to make your request early—at least one month before you need it but earlier is better. Please be courteous in your request, and persistence pays off. An in-person ask can be appreciated and may expedite a response. Recycling – Find out what the town will recycle and how separation should be handled. Details – Identify a location where recyclables/ trash should be left for pickup. Tires – If your site has lots of tires, contact the Bridgestone Tires 4ward tire recycling program for FREE tire pickup and recycling services. You must apply about one month before your cleanup to participate. Can’t secure services? – It is okay to re-approach your town if you have not heard back. Consider stopping by in-person if you did not try that initially. If you are having trouble securing a donation, a local company might be supportive or perhaps a cleanup group near you would be willing to share resources. If you are still having trouble finding ways to dispose of your trash/recyclables, please contact us at cleanup@ctriver.org or 413-772-2020 x211. Appreciation – Remember to thank supporters for their generosity and consider mentioning their contribution in a press release if you do a wrap-up. Local press – Adapt CRC’s sample press release for your group and advertise in a local paper where and when participants should meet. Invite the media – Cleanups make great photo opportunities. Invite local officials or local celebrities to help too. This will shine the spotlight on your group’s efforts in the community. Local advertising – Add your local information to CRC’s flyer and post in libraries, grocery stores, and local shops. Local partnerships – Ask your town officials if they’d like to come out and join you for the day. Ask your local church, community or university group to join you. Some schools have community service programs – environmental club leaders or faculty are good university contacts. Advertise from home – Take advantage of social media and ask your local friends to join in! Keep your group going – Keep a list of who joins you so you can start asking them again next year. Build community and retain enthusiastic help by thanking the volunteers, town staff and businesses who helped you out. Huddle up before heading out – Most events benefit from the group gathering beforehand to touch base and motivate each other. Please make sure participants know hazards to avoid (such as poison ivy, ticks, or unstable banks), the importance of tracking the trash they find and recycling what they can, as well as the necessity to report hazardous materials to the group leader who will then report it officially. Have participants sign in, offer food if it’s available, give a safety talk and tell them what to expect. Have a first aid kit and cell phone or public phone nearby. Encourage volunteers to use the “buddy system,” and everyone using boats or wading deeper than knee level must wear a personal flotation device. Review our Child Safety Guidelines if you have children in your group. Thank everyone for coming and head out on a high note! Share the load – We strongly suggest dividing cleanup duties into roles handled by individuals or teams, depending upon the size of your group. Large groups will need a one person to record trash for every small group of volunteers or section. Clipboards are useful. Recorders can observe and ask cleaners what they are finding, and sorters can separate out accepted recyclables while the bags are filled. Photographers can make their rounds and everyone can switch halfway through to have a diverse experience. All Trash Tallies should be submitted to group leaders. This organized approach has worked very well for other groups. Communicate – Make sure everyone knows what to do and what to look out for. Groups may find it helpful to communicate via cell phones, use walkie-talkies, or even a one-time use phone with a number just for that day. Photographs – We love to highlight your group’s work. Please try to take clear, close-up photos. Label them with photographer credit, the names of those pictured and the location of the photo. All minors need photo releases if we are to consider publishing them on our website or in the Cleanup Chronicle. Submit your photos in our annual Source to Sea Cleanup Photo Contest & you could win some great prizes! If your group finds needles or other sharps, make sure only adults handle and dispose of safely. If you do not have access to a sharps container, place sharps in a puncture-resistant container such as a rigid plastic bottle (laundry detergent) or coffee can with a secure cap. These items must be disposed of at a drop off site or through a medical mail back service, NOT placed in household waste. If your group finds anything you think might be hazardous or volatile, call the appropriate hotline number below and report to CRC. DO NOT move or otherwise disturb the material — leave it ‘as found.’ Make a note of the location or mark the site for the response team. Non-emergencies and complaints may be reported on the Monday following the Cleanup. For emergencies (actively leaking/ threatening), call CT DEEP’s 24-hr. emergency line: 1-866-DEP-SPIL or 860-424-3338. Report non-emergency illegal dumping on state land: 860-424-3333 and on private land to your local DPW or your local Police Department (if you see it happening). If you notice injured wildlife, leave the animal alone and call DEEP (24-hr. line): 860-424-3333. Click here to find an animal rehabilitator in CT.
For emergencies only, call your local fire department first, then call MassDEP’s 24-hr. Emergency Response Force at 1-888-304-1133. For non-emergencies or trash dumping complaints, call your local fire department first, then call MassDEP Springfield office at 413-784-1100. Click here to find an animal rehabilitator in MA. Submit your Trash Tally and Tire Dating Form – Please submit your forms online the day of your cleanup or within 1 week after your cleanup. Submitting your Trash Tally/Tire Dating Forms online helps us to compile the trash watershed-wide and more quickly publish the Cleanup Chronicle. Both forms are incorporated in the online version. If you submit by mail be sure to include both Trash Tally and Tire Dating Form and mail to: 15 Bank Row, Greenfield, MA 01301. Call if you have questions: 413-772-2020 x211. Submit your Volunteer Waivers – Send your waiver forms to CRC, 15 Bank Row, Greenfield, MA 01301. Photographs/Video – You can submit pictures and video clips to us via Facebook or email. Please make sure they are well labeled. Be sure to enter your best photos in the annual Source to Sea Cleanup Photo Contest. You could win some great prizes! Leadership change – If you will no longer be steering the ship, consider communicating with new possible group leaders and participants. A little thank you goes a long way – Remember to thank participants and those who helped you in whatever way you deem appropriate. People like to be remembered through verbal, written or press related appreciation. Tell us what’s left over – If, when you left your site, there was still trash you didn’t get to in time or if you noticed large trash items along the trail or riverbank, please report what’s undone to us so we can maintain a list of needed projects. 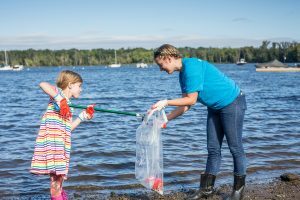 Help keep our rivers clean and healthy all year long – join in supporting CRC with your donation.